If you have a "Then" picture from Saipan and would like me to take a "Now" picture, please scan it and email it to me. German Bell Tower off of Beach Rd., Garapan. Built in 1910 out of wood and rebuilt in cement in 1932 after an earthquake and typhoon. More. 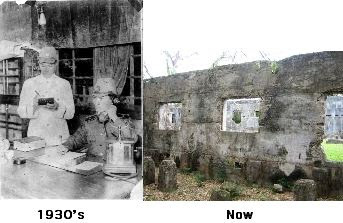 Office at the Old Japanese Jail, Ghiyobw St. off of Middle Rd., Garapan. More. Sugar train used to transport the sugarcane from the fields around Saipan to the Japanese Sugar Mill in Susupe. The engine can now be found at Sugar King Park, Garapan. More. Buddist Temple used for cremation from 1938-1940. Located on Chichirica Ave. Garapan near Old Japanese Jail. Invasion Beach or "Blue Beach" near south Beach Rd., San Antonio. More. American Memorial Park, Garapan. More. Micro Beach, Garapan was a large Carolinian village. The Carolinians sailed from the outer islands of Yap and settled on this spot. More. Garapan was the major town of Saipan during the Spanish times, German times, Japanese times, and still is today. More. WWII Japanese pill box, Micro Beach, Garapan. More. The old Japanese Sugar Mill was bombed in the Battle of Saipan and is now the site of the beautiful Mt. Carmel Church on Beach Rd. in Susupe. Mt. Carmel Church and the surrounding area was also the site of Camp Susupe. From late 1944-1947 the indigenous people were housed here until Saipan was made safe. Notice the smoke stack from the Japanese Sugar Mill still standing in the center of the 1946 picture. Sugar Dock in Susupe was used by the Japanese prior to WWII to load exports onto ships. Today it is used for fishing. Notice the Sugar Mill burning in the background of the 1944 picture. Tanapag Harbor was a very busy port with a large Naval base. None of that remains today. Invasion Beach, U.S. troops coming to shore during low tide. More. German Adminstration building built pre-WWI Garapan. 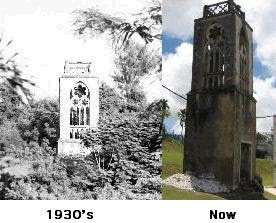 Notice the original wood German Bell Tower still standing above the church roof. More. Railroad tunnel East of San Vicente used to bring sugarcane from Eastern Saipan to the sugar mill on the West coast. More. The Spanish Galleon Concepcion sank in 1638 at Agingan Bay spewing its priceless treasure into the ocean. The ship wreck was rediscovered in 1987. More. An American fuel storage tank mysteriously exploded during the battle of Saipan in Tanapag Harbor taking with it an unknown amount of ammunition. More. In the last days of the battle for Saipan a U.S. soldier spots enemy positions from the top of Suicide Cliff for the American tanks below. More. Built in 1934, this lighthouse is one of the few Japanese Pacific Island lighthouses to survive W.W.II. More. This is one of over a hundred B-29 hardstands from the newly built Isely Field. More. This bunker was originally Japanese. The 2,000-pound bombs used for the Japanese attack on Guam were stored here. Notice the track on the roof used to move the bombs in and out of the bunker. 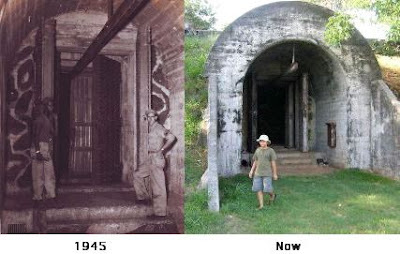 After the Battle of Saipan, American bombs were stored here for the attack on Japan. More. A destroyed 1930's Japanese shrine called 'God of War'. This shrine was used by Japanese and Okinawan sugarcane farmers as a way increase a sense of militarism. Obyan Beach is near Isley Field. See more 'Then' pictures on my Saipan's History site. Thanks George. I add photos, videos, and info to these pages often.